The film, which debuted at the most recent Sundance Film Festival, opens Friday. Luckily for me, one of the movie’s principal characters — and I do mean character when it comes to him — is the Times’ quirky media columnist, David Carr. I met Carr a dog’s age ago, when he ran “The City Paper” in Washington, D.C. He has only gotten more interesting over time, especially as the Web has transformed the news business. 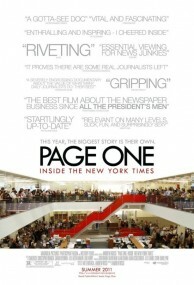 Actually, wrecked the news business seems more the sensibility of “Page One” and also the audience at the screening, which largely bemoaned the troubles that quality papers have gotten themselves into in the age of the Internet. Of course, the situation at the Times is a lot more complicated than that and there are some significant benefits to readers in the new paradigm, even if it did not help traditional media. Carr winks and nods to both sides of the debate in the film — his attack on Web bad boy Michael Wolff over aggregation is priceless, even though he clearly loves the Internet’s thrilling possibilities, too. As I have previously written, what is probably most interesting is that many of the stories covered by the Times in the film are about the technological forces that have put it and other traditional media organizations through the digital ringer in recent years.